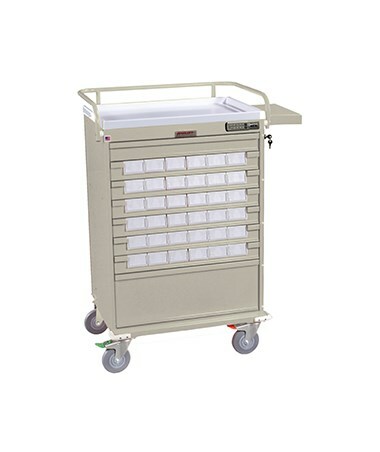 The Harloff Value Line Med Bin Cart with Internal Narcotics Box, Standard Package is a budget-friendly medication storage device designed with the same functionality of the larger Harloff Medication Carts. Well-Built and Secure. 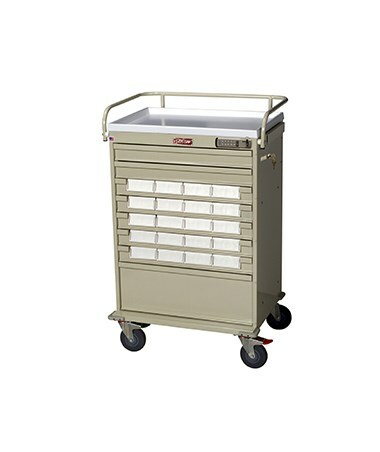 Made with an all-steel and latex-free construction, the Value Line Med Bin Cart is durable and has a hard-baked powder coated finish with various colors to choose from. 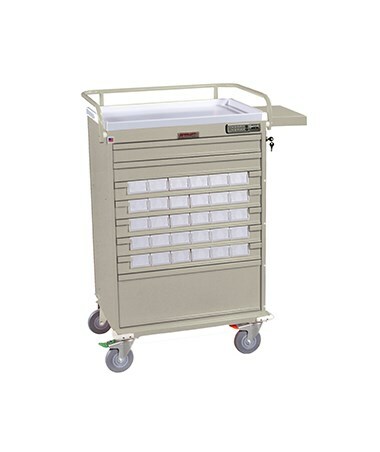 It features 8 drawers with various configurations that mounted on ball-bearing, full extension slides and has internal dimensions of 23" W x 17" D. The cart includes a removable plastic top, a pullout shelf with a writing surface of 43.25" and 9" internal locking narcotics box. Each individual bin can easily be removed as needed. Hassle-free Mobility. 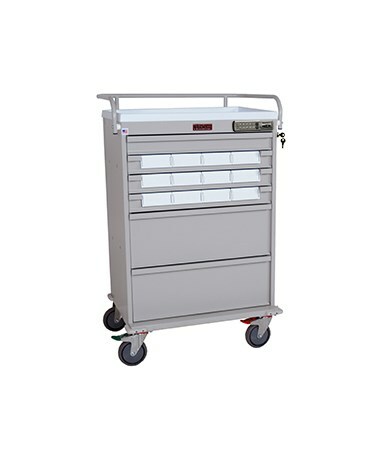 Mounted on 5" Premium Ball-Bearing Full Swivel Casters with one directional and one with brakes, the Value Line Med Bin Cart with Internal Narcotics Box, with the help of steel top rail/push handle, can be transported around the facility easily. 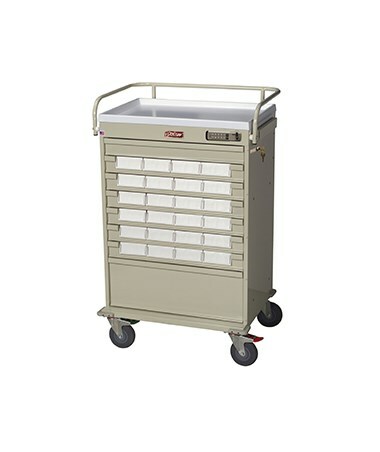 The base of the cart has a bumper frame with projected front casters and 4 corner bumpers on a separate bumper frame for added protection. 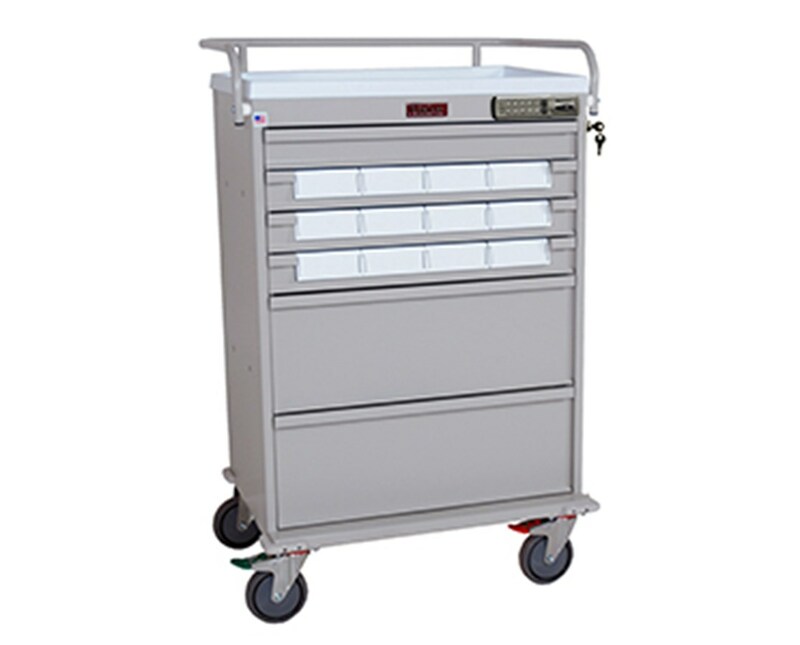 We offer the same cart with a different package: The Harloff Value Line Med Bin Cart with Internal Narcotics Box, Specialty Package.